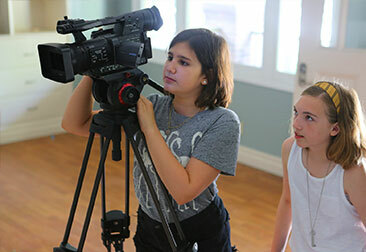 The 2-Day Holiday Filmmaking Camp for kids takes students on an accelerated adventure as they explore camera, sound, and post-production, and work collaboratively to shoot and edit their projects in high definition digital video. As with all New York Film Academy programs, the focus of the kids holiday camp is on learning by doing. Throughout their two days enrolled in the program, students are guided through hands-on activities including directing a film using an open-ended script, and writing, lighting, framing, filming, and producing their film. These essential skills will empower students to more easily explore their passion for filmmaking going forward. 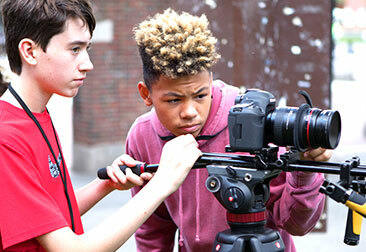 Students rotate through the necessary crew positions of director, cinematographer, assistant cameraperson and actor on location in and around the Academy’s campus locations in New York City or Los Angeles. Students use the foundation skills taught in class to create short, filmed scenes that will be celebrated at a screening on the conclusion of the second day. The 2-Day Holiday Filmmaking Camp is a fun and fast-paced experience, excellent for local students or students visiting the Big Apple or Hollywood on holiday or vacation who want a hands-on introduction to the basic principles of filmmaking. Want to learn more about the 2-Day Holiday Filmmaking Camp for kids or download an application?